YELLOWSTONE NATIONAL PARK, Wyoming, July 7, 2011 (ENS) – A 57-year-old Torrence, California man has been identified as the victim of a fatal grizzly bear attack in Yellowstone National Park on Wednesday. Brian Matayoshi, a pharmacist, and his wife Marylyn, were hiking Wednesday morning on the Wapiti Lake Trail, located off the South Rim Drive south of Canyon Village and east of the park’s Grand Loop Road. The couple was hiking west back toward their vehicle at about 11 am, when, at a point about a mile and a half from the trailhead, they walked out of a forested area into an open meadow. Park officials said it appears that the couple spotted the bear about 100 yards away and began walking away from the animal. When they turned around to look, they reportedly saw the female grizzly running down the trail at them. The couple began running, but the bear caught up with them, attacking Mr. Matayoshi. The bear then went over to Mrs. Matayoshi, who had fallen to the ground nearby. The bear bit her daypack, lifting her from the ground and then dropping her. She remained still and the bear left the area. Mrs. Matayoshi then walked back toward the meadow and attempted, without success, to call 911 on her cell phone. She began to shout for help and was heard by a distant group of hikers who were able to contact 911 by cell phone. Two rangers already in the area on backcountry patrol were contacted by the park Communications Center by radio and responded to the scene of the incident. Mr. Matayoshi received multiple bite and clawing injuries, and was dead when rangers arrived at the scene at approximately 11:30 am. Rangers immediately closed the hiking trails in the area. A helicopter patrol of the area failed to turn up any other hikers or backpackers. 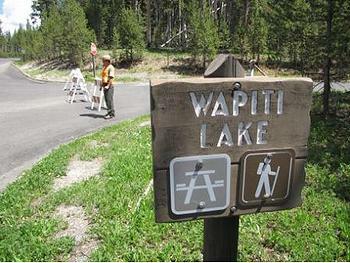 This small section of the park’s backcountry is expected to remain closed for several days. “This female bear is not tagged or collared, and does not apparently have a history of aggression or human interaction,” they said. Typically, the National Park Service does not trap, relocate, or kill a bear under those circumstances. A Board of Review which will include interagency experts will be convened to review the incident. Bear attacks are extremely rare, park officials said. This is the first time a human has been killed by a bear in the park since 1986. Park visitors are encouraged to stay on designated trails, hike in groups of three or more people, and be alert for bears and make noise in blind spots. Visitors are also encouraged to consider carrying bear pepper spray, which has been shown to be highly successful in stopping aggressive behavior in bears. The Matayoshis were not carrying pepper spray.